My Tile Shop Photo Shoot – The “After” Pics! If you caught my post on Monday you got a behind-the-scenes look at my kitchen’s photo shoot with The Tile Shop – and now here’s a look at things in front of the scenes! Oh hi. I’m just hanging out in my gorgeous new kitchen. Can you spot all the changes? Let’s break ’em down! 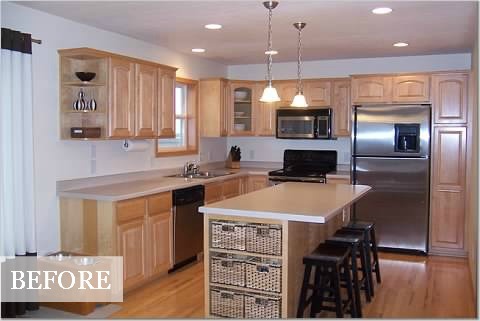 First, I painted the kitchen four times before settling back on pretty much its original ivory color. Next came accessories and furniture. Six years after moving in, we finally upgraded our laminate countertops to granite. To keep up with the needs of our busy (and artistic) family, I added a kitchen calendar command center, and a display for Kate’s artwork. 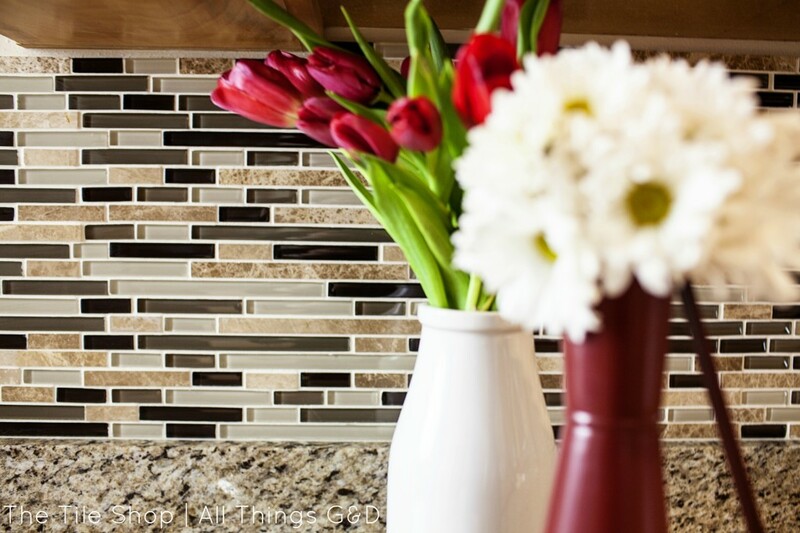 This brings us to our gorgeous new DIY tile backsplash – the star of this post! Last, but not least, we switched out our boring little pendants over the island for these large, stainless steel industrial pendants from Home Depot – they’re the perfect finishing touch for the space and I love them SO MUCH! 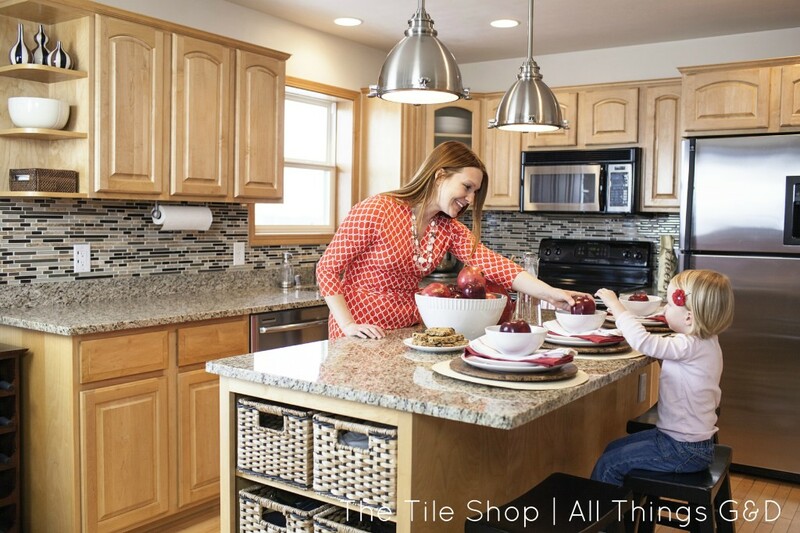 Look at all that pretty tile…ooh, I love it so much! Told you I busted out the wine! Even my daughter Kate (age 3) got in on the photo shoot action! This whole experience has been so much fun, and so rewarding! It’s amazing to see what an impact a few feet of tile has had on our kitchen. It’s brought a depth and warmth to the space that leaves its original “builder basic” state far from memory, and I could not have done it without The Tile Shop! 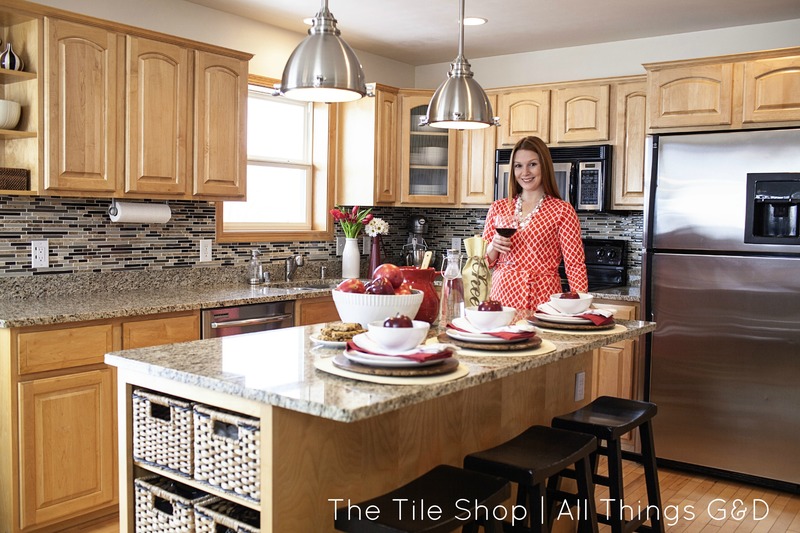 Now that I’ve shown you how easy it is to DIY and what a huge impact it can have, who’s ready to tackle their own tile project? I’m so excited to say I’m this month’s featured blogger at TileShop.com! 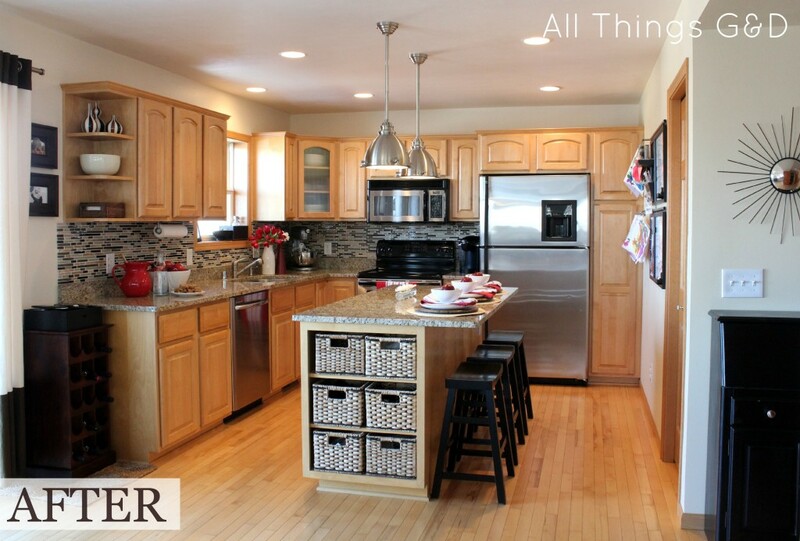 Check out my feature for even more “after” pictures of my kitchen, along with my project write-up and DIY tile tips! UPDATE: Just when I thought it couldn’t get any better…all that gorgeous new backsplash tile inspired me to paint the kitchen gray. Click below to check it out! Gorgeous! You did an amazing job and that kitchen is utterly gorgeous! The photos are gorgeous, Dusty! Everything is perfect, from the tile to the pendants, and the bits of red! Thank you Cait! I’m so thrilled with how it all turned out – thank you for noticing! Beautiful kitchen. 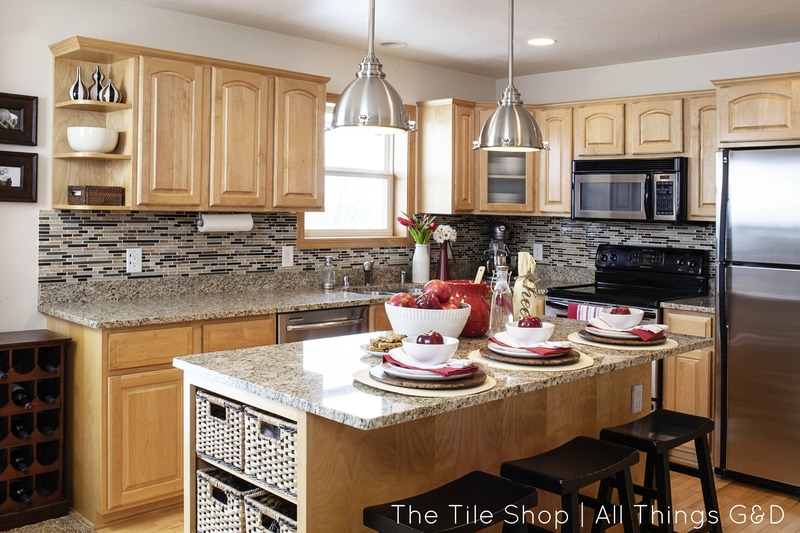 The tile adds so much to your kitchen. I love all the warm tones and pops of red. I’m wondering where you got the wicker baskets in the island as I have similar shelves in mine and those baskets would be nice. thanks! Thank you, Joan! The baskets at the end are from Target. I bought them several years ago so I don’t think they carry these same ones anymore, but I’m sure you can find something similar! Looks great! The update are perfect. Just let me know when you’re ready to tackle my kitchen. 😉 BTW, how come you’ve never added hardware the the cabinets? I think they look great as is, just curious. Thank you so much Carla! I’ll put you on the list of people who have made that very same request. I believe this makes you Person #1,987, haha. I am definitely a “less is more” kind of girl. I like clean lines, minimal fuss, and minimal accessories. There’s no NEED for pulls or knobs for the cabinets (they have hidden carve-outs for opening), and I’m not one to add ornamental things simply for the sake of adding ornamental things. I blame growing up in a house full of clutter for my aversion to all things accessories, haha! I don’t know what’s most gorgeous, the happiness you’re radiating or that awesome tile. Beautiful job. Great photos! This is totally random, but I noticed you replaced Chase’s water bowl with a (very pretty) wine cabinet. Do you still have Chase? I haven’t heard you blog about her since before Kate was born. Sadly, Chase is no longer living with us. After several months of aggression toward Kate and having our house on Fort Knox-style lock-down, we made the heartbreaking decision to place Chase with another family that did not have any children. Thank you so much, Kate! You are such a sweetheart. I love the pendant lights! Where did you get them? Thank you, Erica! They’re from Home Depot – a steal! I love what you did to your kitchen. We have the same cabinets as you in our house. They we there when we moved in. Do you know what brand they are because we need to replace one of them. where did you get the tile for the backslash? and what is the name of the tile, and color? 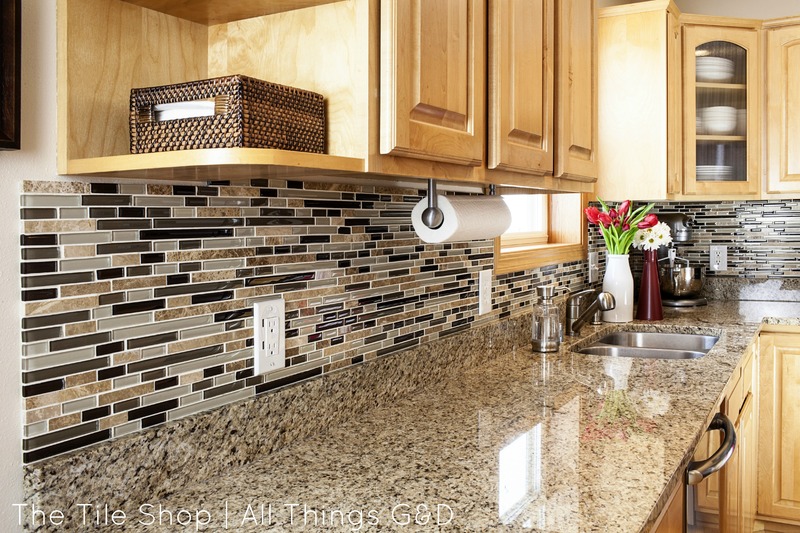 I have the same granite, and am having a very hard time matching glass tile for backsplash. what you have is perfect. 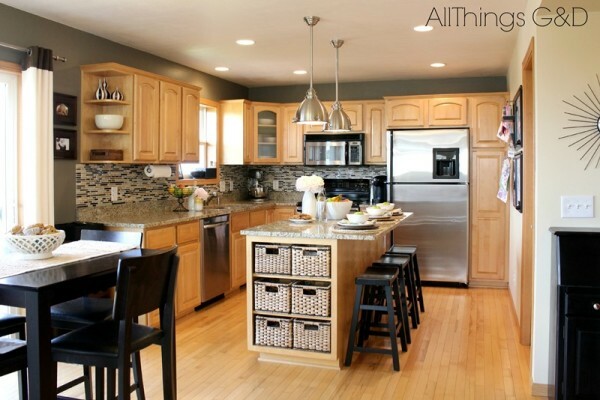 I saw one of your pictures if your gorgeous kitchen in pinterest, and I had to do a double take because it looked just like my old kitchen. We bought the same tile from Costco and we had the same countertops and cabinet color. I love it! 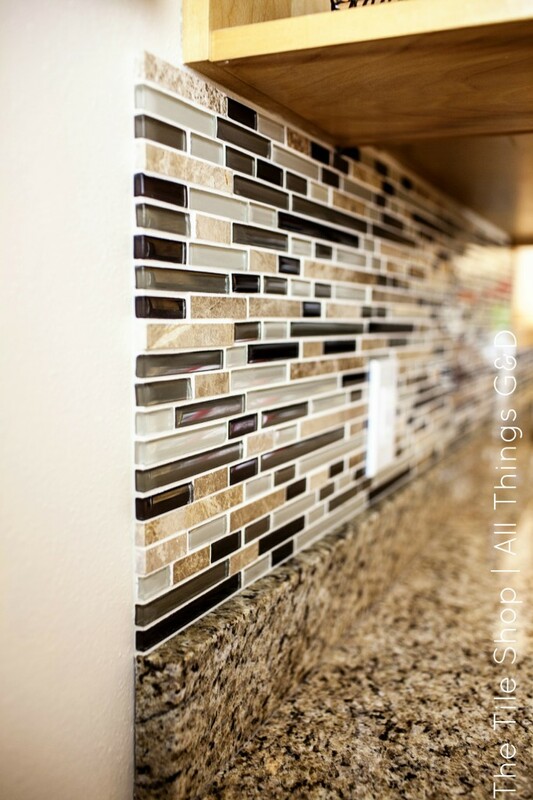 Where did I get the mosaic tile backsplash and what is this color called?